On March 4, on a display floor at the Houston Livestock Show and Rodeo, two cowboys from south Texas’ King Ranch pulled back a tarp to reveal Ford Motor Company’s revamped 2015 Expedition King Ranch SUV. The 2015 Expedition was first shown to the public at the Dallas Fort Worth Auto Show in February, but with the unveiling in Houston the public was given its first chance to see the 2015 King Ranch trim line, which the Expedition, a full-size SUV, shares with its Ford stablemates, the F-150 and Super Duty line of pickup trucks. For 2015, the King Ranch models will be available with exterior color choices of Bronze Fire, Caribou, Guard, and Ruby Red Metallic Clearcoat. A Mesa Brown leather interior will be available for the King Ranch models only. The Expedition King Ranch will come standard with 20-inch machined-aluminum wheels, the same as the F-150 and Super Duty line of trucks, but it will have the option of 22-inch wheels. Ford says the pricing of the 2015 Expedition King Ranch will be released when the SUV is available at dealerships later this year. In conjunction with the unveiling of the new Expedition King Ranch at the Houston Livestock Show and Rodeo, commonly known as RodeoHouston, Ford also premiered a promotional exhibit of photographs by Texas State photographer Wyman Meinser. The exhibition presents a selection of over 4000 photographs Meinser took of Ford Expedition, F-150, and Super Duty vehicles at south Texas’ famed King Ranch. King Ranch, founded in 1853 and covering 825,000 acres between Brownsville and Corpus Christi, is one of the largest ranches in the world, and it has had a relationship with Ford Motor Company since 2001, when the company released its King Ranch model F-150. 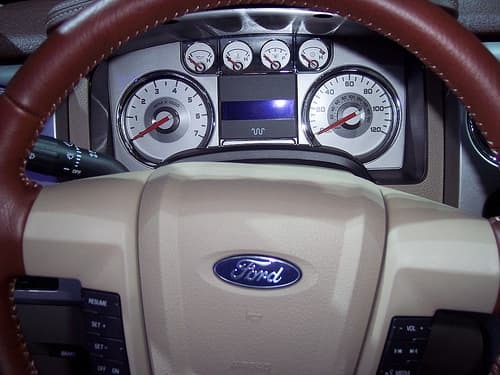 The Expedition and Super Duty line of vehicles joined the King Ranch line in 2003. Over 350 of the Ford trucks and SUVs are currently in service at the ranch. Ford said that it decided to unveil the 2015 Expedition in Texas because Texans are among its biggest fans, especially of the King Ranch model of the SUV. That popularity extends also to the King Ranch pickup trucks. Nearly half of Ford’s entire King Ranch line of vehicles are purchased within the state.